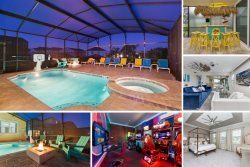 Homestead Contemporary- 4 Bed Luxury Villa in Reunion Resort with Screened Pool and Games Room! This ultra modern Reunion home is located within the Homestead area of Reunion, situated within easy walking distance to the Reunion Grande, The Clubhouse and The Seven Eagles Pool and Pavilion. Walk into the door of this home and you will be blown away by the ultra modern and sleek decor of this villa. You will find all tile and hardwood throughout giving it that fresh and cool Florida feel. To the right of the entry is the bright and airy dining area with a large table and seating for 8. The home opens up into the combined kitchen and living area. The kitchen is fully equipped, and features upgraded stainless steel appliances. It also features a breakfast bar with seating for five. Relax on the brand new micro-suede sofa and enjoy a movie on the 60" LED SMART TV, and bring it to life on the BOSE surround sound. There is a large air conditioned Games Room in the rear of the villa with 50" LED SMART TV and PS3 with gaming chairs. The Pool table turns into a Ping Pong Table. Great entertainment for the whole family! The chic modern decor of this home is followed throughout. The master bedroom is furnished with a King size bed and a 42' LCD TV with Blu-Ray player. You will also find an En-suite bathroom featuring a large garden tub and walk in shower. Step out into the screened pool area with your own private door for added convenience. The north facing pool measures 24 x 12 and is complete with a spill over spa perfect for unwinding from those long days at the park. The area does have a safety child safety fence for that extra piece of mind. The other three bedrooms in this home are furnished with queen size beds, and 32" flat screen TV's complete with Blu-Ray players. They all share a large bathroom with a tub, and shower combination and a double vanity sink. The vibe and feel of this villa is an art deco lovers dream, paired with the world-class amenities such as infinity pools, full-service spa, scenic walking trails, fitness center, on-site fine dining, kids activities and much more this villa is truly a vacation in itself. We had a wonderful time at the Reunion Resort. There is so much to do and just a short drive to Disney activities. loved it, we'll definitely be back!!!! We visit Florida usually once or twice a year. Reunion is our favorite resort when we rent a home. On occasions we have stayed at Windsor Hills and Emerald Island, but sometimes the online information for those properties have been deceiving when you actually arrive. Very good experience working with the knowledgeable staff during the reservation process. Great location and amenities. Looking forward to our next visit.